The Matsuyama Air Group was established in late 1943 in order to give preparatory flight training for the Navy's Yokaren (Preparatory Flight Training Program) trainees. From October 1944 to the end of the Pacific War in August 1945, many Yokaren airmen died in special (suicide) attacks as part of the Kamikaze Special Attack Corps. The Matsuyama Naval Air Group was established here at this place of Yoshidahama in October 1943 when the war situation had become critical. During the especially intense Pacific War, young men who were burning with desire to provide defense during their country Japan's fateful crisis gathered together. In order to supplement quickly air power that had been considerably depleted, rigorous training of aircraft crewmen was carried out. In the short period of two years until the end of the war, a total of 15,000 men were trained including the 13th, 14th, 15th, and 16th classes of the Navy Ko Hiko Yokaren (Preparatory Flight Training Program) and the 24th class of the Navy Otsu Yokaren. The young eagles who left their nest at this place carried out hisshi (inevitable death) attacks on enemy ships from the air, on the seas, and through the water. Many young cherry blossoms (men) dedicated themselves with loyal sincerity and went and died in battle with dedication to an eternal cause. We who survived until the end of the unfortunate war in August 1945 did not want our comrades' deaths to be wasted and aspired for the reconstruction of a peaceful Japan. Not forgetting the Yokaren spirit that was fostered in this place, we overcame many postwar problems and worked towards the country's resurgence. After seeing already 40 years pass since the war's end, we pray that the spirits of our friends from the same Yokaren classes who went and died in battle at a young age may rest in peace. This monument records here that historic site to convey to future generations the history of Matsuyama Naval Air Group that formerly existed at this place. 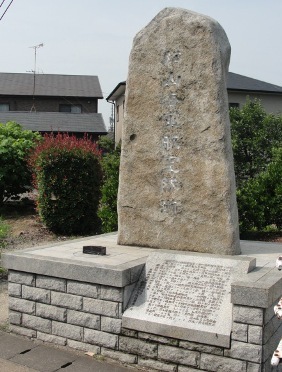 In 2001, about a kilometer away from the monument described on this page, the Matsuyama Naval Air Group Site Monument was erected by Matsuyama Air Group 14th Ko Yokaren Class Association.